China will be able to delay an increase of President Donald Trump’s tariffs, but will not escape that hit permanently, according to economists surveyed by Bloomberg News. None of the 29 China-watching analysts surveyed in the past week expect the US to increase tariffs on Chinese goods on March 1, a deadline set last year and one which negotiators in Washington this week are racing to meet. 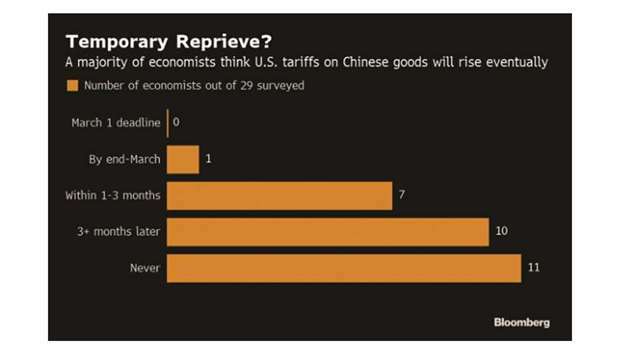 That said, 18 of the analysts assume that tariffs will ultimately rise, signaling low confidence that China and the US will be able to come to a permanent accommodation over their differences on trade and industrial policy. Trump plans to meet with China’s top trade negotiator Friday afternoon as the US tries to forge a preliminary deal with its biggest economic rival, two people familiar with the matter said. The outlook for China’s slowing economy depends to a large degree this year on clearing the uncertainty around higher tariffs. If the threatened extra duties on some $200bn of China’s exports to the US are imposed, that could shave 0.3 percentage point from the nation’s economic output growth this year, according to Bloomberg Economics. China has repeatedly offered to increase purchases of agricultural and energy products to shrink the deficit, as the Trump administration is pushing for what it terms “fair and reciprocal” trade. More fundamental issues – such as technology transfers and the way China treats its state enterprises – require more substantial concessions that China is reluctant to offer. With a slowdown deepening, policy makers in the Asian nation are boosting lending to private companies and expediting local government debt sales to support infrastructure construction. Such investment in roads, rails or telecom networks will rise by 9% in 2019 from a year earlier, according to the median of economists surveyed, up from 3.8% last year. Meanwhile, China’s top leaders said they will work to keep the economy operating within a “proper range,” and reiterated that monetary policy will remain “prudent” and fiscal policy will remain “pro-active,” state-run Xinhua News Agency reported yesterday. A meeting of the Communist Party’s politburo, chaired by President Xi Jinping, discussed the draft of the annual government work report which is set to be released at the upcoming National People’s Congress meeting in early March, Xinhua reported. The meeting said China should “comprehensively implement macroeconomic policies, structural policies and social policies,” while prioritising employment. Analysts usually watch closely for the growth target set in the report, which signals the leadership’s expectation of the nation’s economic situation. Policy makers could also announce new measures to shore up the sagging economy, such as tax cuts or reforms in certain sectors. The meeting also pledged to keep fighting the “three critical battles”, namely campaigns against financial risks, pollution and poverty that started in 2017. The key tasks for the year would be to further stabilise employment, finance, foreign trade, foreign and domestic investment as well as market sentiment, the politburo said, adding that the nation will deepen reforms in major areas and promote all-round opening up.